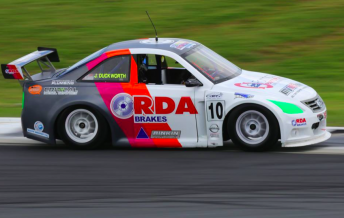 James Duckworth secured a maiden Aussie Racing Cars title as Charlotte Poynting and Craig Woods shared the spoils in the final two races of the season at Hampton Downs. Duckworth edged Woods to the championship after finishing ninth and eighth respectively in Sunday’s races. Woods put up a strong fight for the title as he fought from the back of the grid to third in the reverse grid race, before finishing second in the final heat of the year. The opening race of the day saw Poynting come through the pack to score her maiden victory and podium in the category. Starting from ninth on the grid, Poynting managed to surge through to the lead by lap 3, where she stayed for the remainder of the 8 lap reverse grid race. Glenn McNamara settled for second ahead of the charging Woods, while Kel Treseder finished fourth ahead of Brendon Tucker and Peter Carr. The final championship race of the year provided a thrilling three-car battle between Treseder, Woods and Carr for the win. Treseder quickly assumed the lead with Woods and Carr in hot pursuit. The trio quickly broke away from the pack before they began to dice which saw the lead change hands on several occasions. Despite coming under immense pressure, Treseder managed to hang on to take the win by 0.04s in a drag race to the flag from Woods, with Carr in third. Aussie Racing Cars will return for a seven round series next year beginning at the Clipsal 500 in Adelaide from March 2-5.